To dominate the battlefield you will need to command more than 25 unique unit types, mastering their special abilities. Raise morale with the Sergeant at Arms, charge in with the Sassanid Knight, use Archers to launch an arrow volley or scale castle walls with the deadly Assassin. Once your skills have been perfected put them to the test in skirmish mode or take the battle online with up to eight players. Create teams, choose different AI opponents and design your own map in the ultimate skirmish or multiplayer game! ©2014 FIREFLY STUDIOS LIMITED. All rights reserved. 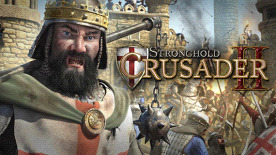 Stronghold Crusader 2 and FIREFLY STUDIOS LIMITED are trademarks or registered trademarks of FIREFLY HOLDINGS LIMITED.